Well, here are simple instructions showing you how we coat our neodymium magnets with Plasti-Dip or other, similar rubberized coating. Plasti-Dip and other brands of rubberized coatings can be purchased at most hardware and home improvement stores in the tool section, since it is most commonly used to rubber coat the handles of hand tools. All rubberized coatings come in a sealed metal can. 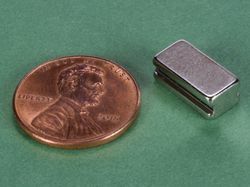 Neodymium magnets are strongly attracted to metal, so as you can imagine, it is quite difficult to get the magnet in, and back out of the narrow can without it becoming stuck to the sides. You will have to pour the rubber coating into a resealable glass jar. The jar should have as wide a mouth as possible to give you more room to work. Wide-mouth pint sized Mason jars work very well for this. Make sure your flat metal surface is clear and ready and that one bolt attached to one magnet will stand on the bolt as shown. This will be the drying position for the dipped magnets. Make sure your Plasti-Dip is mixed well before proceeding. 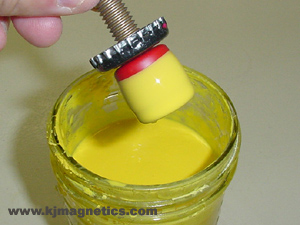 Take one magnet with a bolt attached and use the bolt as a handle to dip the magnet into the rubberized coating. We have found that the best results are obtained if you dip slowly and stop about 1/16" -1/8" from the edge of the face that the bolt is on. 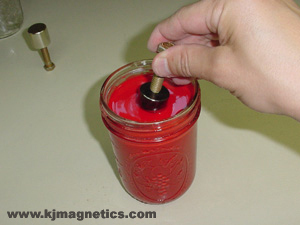 Allow the excess rubber coating to drip back into the jar. Spinning the magnet slowly during this time helps to keep the coating even. 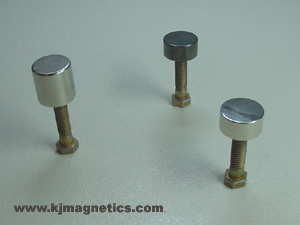 Place the bolt and magnet assembly on your flat metal surface. If you are dipping more than one magnet, do the same with the others, making sure to keep sufficient distance between the drying magnets. If the magnets get too close together, they can jump to each other and things can get quite messy. 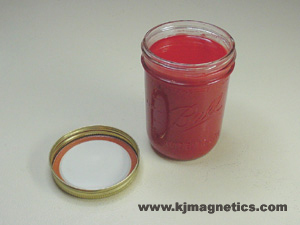 After the first coat of rubber is dry, place the flat part of a bottle cap on the rubberized side of the magnet. 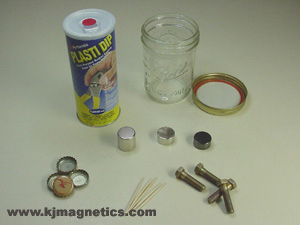 Then remove the bolt from the uncoated side of the magnet and place it on the bottle cap. 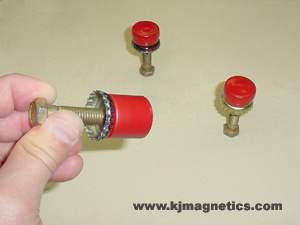 For small magnets, the bottle cap is not necessary - simply stick the rubber coated side of the magnet to the bolt. Dip the uncoated side of the magnet into the rubber coating, again, stopping 1/16" - 1/8" from the edge near the bottle cap. For the picture, we used a different color for the second dip to make it easier to see. Repeat steps 6 and 7, alternating sides of the magnet, until desired rubber thickness is achieved. We have found that 4-8 coats per side seems to work best. 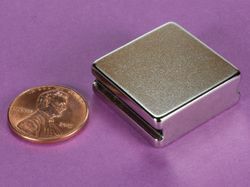 You will now have a colorful, well-protected and weather-proof neodymium magnet. 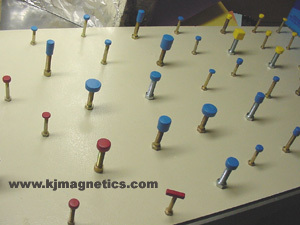 The rubber coating will protect your magnet very well from damage due to contact with other magnets and hard surfaces. 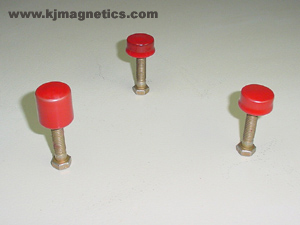 If the rubber coating becomes damaged or worn, simply cut it off and recoat your magnet with the rubberized coating.